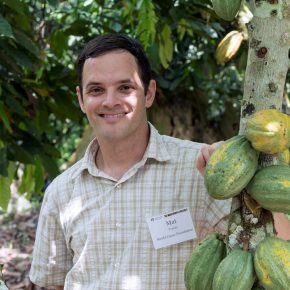 Mat Travis is the Human Resources & Operations Manager at the World Cocoa Foundation. Mat’s most important function at WCF is to maintain a high volume & quality of chocolate available to all staff and guest at a moment’s notice. In between supporting our IT systems, tracking WCF staff & travelers around the globe, onboarding new staff, and keeping the lights on at the WCF DC office, Mat strives to balance staff’s intake of epicatechin and catechin. Previously, Mat worked in the entertainment industry, assisting in concert and festival productions in over 30 countries, overseeing diverse cultural and multi-lingual crews. His development experience stems from time in Liberia with Franciscan Works where he cooperated with government ministries, international and local NGOs and community members to enhance the organization’s programming and implement new projects. Mat holds BAs in History and Politics from Brandeis University.